Steel channel, made of hot-rolled carbon steel, is manufactured with a vertical web, top and bottom horizontal flanges, and inside radius corners. 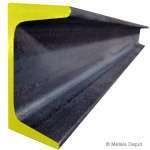 Metals Depot supplies a wide range of sizes and thicknesses. The channel shape provides superior structural support, making it an ideal product for frames and braces used for machinery, truck beds, framework, architectural trim, marine, building, structural support applications, and more. 6061 Aluminum Channel, made of extruded aluminum, is used when greater strength is required. Broadly used for fabrication, it is corrosion resistant, has good machinability qualities, and welds well. 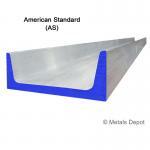 Shop for Aluminum Channel - 6061 Online! 6063 Aluminum Channel, composed of extruded aluminum, has sharp interior and exterior corners, making this ideal for trim applications. Lightweight and corrosion resistant, it is easy to cut, weld, form, and machine. 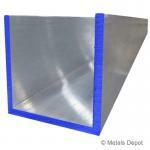 Shop for 6063 Aluminum Channel - Sharp Corner Online! Shop for Galvanized Steel Channel Online! Stainless Steel Channel has inside radius corners and is ideal when greater strength and corrosion resistance are required. Its durable dull finish weathers well when exposed to acidic, fresh and salt water, and chemicals. Shop for Stainless Steel Channel Online! 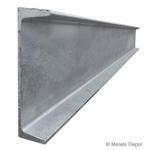 Shop for A36 Structural Steel Channel Online!